Cloud storage company Box has acquired HTML5 document embedding service and Y Combinator alum Crocodoc, both companies announced in a press briefing today. Financial terms of the deal, which was a cash and stock transaction, were not disclosed; however, Box CEO and co-founder Aaron Levie said that it was a successful exit for investors. Crocodoc has raised a little over $1 million in funding from Y Combinator, SV Angel, Paul Buchheit, Joshua Schachter, Dave McClure, Steve Chen and XG Ventures. Crocodoc was founded in 2007 by four MIT engineers, but eventually pivoted in 2010 to kill off Acrobat. The startup’s initial Flash-based technology allowed you to upload a PDF, and receive a version of the same document in your browser, which you could then share with coworkers and annotate with notes, highlighting, text, and a pen tool, with changes that show up to other users in real time. In 2011, Crocodoc launched this technology in HTML5 for mobile embedding. For example, Dropbox has used Crocodoc’s HTML5 document viewing solution to allow their users to view documents in their web browsers and mobile devices without having to download large files or use desktop software (you can see an example here). 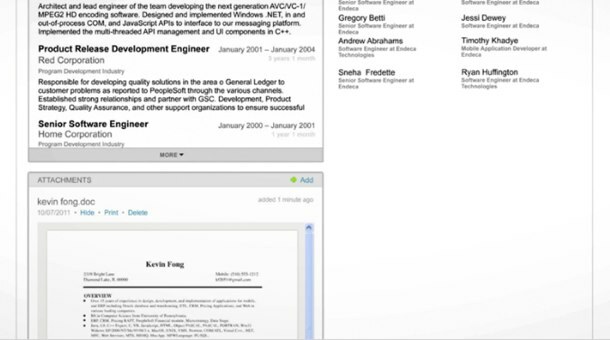 Via LinkedIn’s Recruiter product, Crocodoc enables recruiters to upload candidates’ resumes in Word and PDF formats without having to download files and open them using desktop software. Customers can also customize the appearance and behavior of Crocodoc’s viewer and access built-in commenting, annotations, highlighting and drawing tools. Crocodoc, which now has seven employees, says that it has powered 189 million document previews and 14 million document annotations. Also worth noting — earlier this year, Crocodoc launched a new version of its converter, which uses both HTML5 and scalable vector graphics (SVG). With the last version of the player, text was overlaid on top of the image using HTML web fonts. The newer version displays everything in the document as HTML5 and SVG, making for crisper lines and shapes in the converted documents. Documents also load significantly faster, as the browser won’t have to load a large image to display. As Levie explained today, Box acquired Crocodoc because the company wants to reimagine what documents look like in the cloud. “We’re focused on building the simplest way to let businesses store and manage documents anywhere, and were looking for ways to change how users interact with content,” he says. We’re told that Crocodoc will continue to be operated and licensed to existing and new users, but Box will integrate Crocodoc’s technology into its own cloud storage platform to allow customers to have a seamless use of the embedder and viewer. And there’s much more that Box and Crocodoc CEO Ryan Damico want to do with the product within the Box family. Damico, who will become Box’s director of platform, will be running content services for the company, and the entire Crocodoc team will be joining Box. Next up for the product? Damico explains that more secure documents viewing, mobile collaboration, real-time presentation, form-filing and document authoring will all be added in the coming year. Levie says there will also be a new version launching later this year with new viewers like a flip-book-like technology, as well as a carousel experience for documents. There will also be new branding around the Box Platform, he added. Sam Schillace, Box’s VP of engineering who was also one of the founders of Google Docs, explains that Crocodoc’s technology doesn’t look or feel like enterprise software. “It looks so beautiful and polished, and it is a standard all have to shoot for when viewing documents,” he says. With 15 million users, and 150,000 businesses across retail, health care, financial services and more, Box is growing fast as it eyes a potential public offering in the next year. Part of growing further will be around adding compelling experiences to the user experience. Levie says that 2 billion content events happened in Q1 alone, so thinking about new ways to improve content experiences makes sense. And Crocodoc is an interesting move considering that its technology is used by one of Box’s main competitors, Dropbox. It’s no secret that Dropbox has its own ambitions around content, as explained by AllThingsD earlier this year. But Box believes that they, along with Crocodoc’s technology, can be the leader in improving every experience you have with documents on the Internet. Similar to the way that YouTube remade the online video experience and Facebook and Flickr reimagined the photo experience, Box wants to make embedding documents less clunky.